DANIEL LUCIUS “DOC” ADAMS, M.D.! “He’s the true father of baseball and you’ve never heard of him.” – John Thorn, Major League Baseball’s official historian, on the newly discovered founder of modern baseball, Daniel Lucius ‘Doc’ Adams. Click here for the latest Doc news! Sign-up for email updates on Doc and the efforts to get him into the National Baseball Hall of Fame by entering your email in the box at right and clicking ‘Subscribe’. 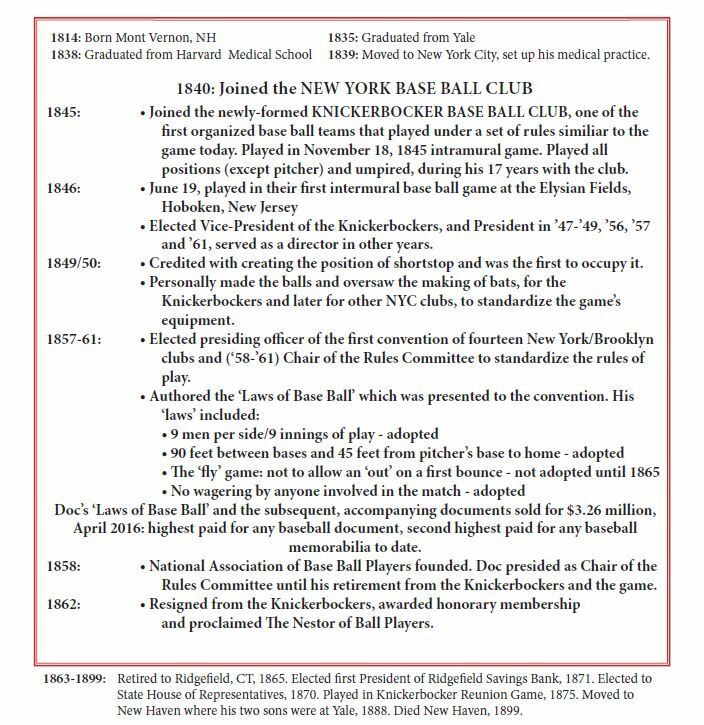 To advance the truth of the origins of the game of baseball and ensure that Daniel Lucius ‘Doc’ Adams is acknowledged for his contributions and achievements in the advancement of the game. For too long, his accomplishments have gone without public recognition or have been credited to others. As more complete and accurate research has documented Doc’s place in baseball history, it is time to honor him with enshrinement into the National Baseball Hall of Fame where he can take his rightful and long-overlooked place alongside the other baseball pioneers. Daniel Lucius “Doc” Adams is one of the early pioneers of baseball. The origins of baseball have always been a little murky and shrouded in mystery. Everyone has heard the now discredited myth of Abner Doubleday, a distinguished Civil War general, being the father of baseball. Doc Adams’ contributions to the game compare favorably, and some would argue even surpass those of others recognized and enshrined in the Hall of Fame. Click here to find out about our petition and to sign it.